Scientists at the Stuttgart Natural History Museum and colleagues have discovered a new insect order from the Lower Cretaceous of South America. 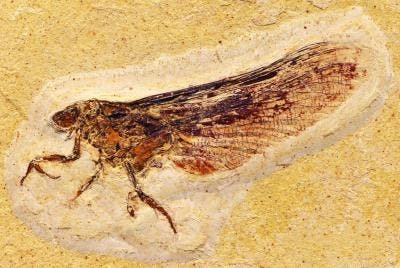 The spectacular fossils, named Coxoplectoptera by their discoverers, represent extinct relatives of modern mayflies, but significantly differ from both mayflies and all other known insects in anatomy and mode of life. The work group led by Dr. Arnold H. Staniczek and Dr. Günter Bechly, both experts on basal insects, determined that these fossils. With the discovery of adult winged specimens and excellently preserved larvae, the scientists were able to clarify the phylogenetic position of these animals and presented a new hypothesis regarding the relationships of basal winged insects. Equipped with wing venation of a mayfly, breast and wing shape of a dragonfly, and legs of a praying mantis, these winged insects look like a patchwork of various animals. The peculiar larvae, however, are reminiscent of freshwater shrimps. Their lifestyle turned out to be a major enigma: their mode of embedding and certain other characteristics clearly suggest a fluvial habitat. Their unique anatomy indicates that these animals were ambush predators living partly dug in the river bed. These animals furthermore provided clues to the long-standing controversial debate of the evolutionary origin of the insect wing. The scientists presume that wings originated from thoracic backplates, while leg genes were recruited for their developmental control. The Daily Galaxy via EurekAlert!, a service of AAAS.